Bentleigh Greens has added yet another piece of silverware to its bulging trophy cabinet by capturing a third community shield trophy in four years after defeating arch-rival Heidelberg United 2-0 on Thursday evening at ABD Stadium in Broadmeadows. Greens striker Matt Thurtell scored twice to give his side a well-deserved victory against the reigning NPL champions. 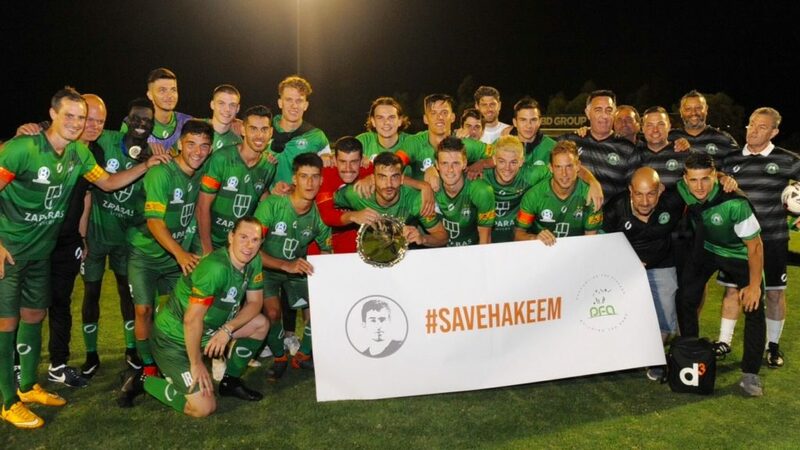 The season curtain-raiser was dedicated to the Save Hakeem campaign. Prior to kick off, players from both teams joined players from each of the other NPL clubs in front of an oversize banner with the words SAVE HAKEEM blazoned across it, in a united show of support for the detained footballer awaiting his fate in a Thai court. The Bergers fielded a virtually unchanged line-up to the team which won last season’s NPL grand final whilst the Greens, in contrast, included four new recruits in its line-up. Midfielders George Lambadaridis and Josh Baressi, as well as pacey winger Valentino Yuel, and right back Matthew Crooks made impressive debuts for the Greens. The Bergers began the game promisingly when an Alex Schiavo header almost gave them an early lead foiled only by Greens’ keeper Ryan Scott’s terrific diving save. As it turned out, it was one of the rare occasions in the match that Scott was tested. Minutes later, Greens’ striker Thurtell opened the scoring when he finished an incisive combination down the left flank with new signing Baressi providing the final pass. As the half progressed, the Greens started to control possession well and created most of the major scoring chances. A Thurtell header from a Yuel cross, rebounded off the woodwork, whilst the striker shot wide from another good chance just before the break, from a Velibor Mitrovic assist. For the Bergers, winger Andrew Cartanos provided their best avenue towards goal in the first half. At the break, the Greens players had a spring in their step as they jogged off the park into the dressing room. In contrast the Bergers trudged wearily into the rooms for a much needed break.The pattern of play continued after the break with the Greens enjoying the major moments and looking the most likely team to score. The Bergers were fortunate to stay in the match as long as they did with the woodwork denying both Mitrovic and Yuel from extending the Greens’ lead. Bergers’ sub Harry Noon tried to fire his team up with his physicality in the second half, producing some robust tackles. However, Greens’ marksman Thurtell doubled his team’s lead in the 80th minute with a well taken first time shot. With moments remaining Noon hit the cross bar with a long range shot in one of the Bergers few attempts on goal. Valentino Yuel received the Man of the Match award after the game, to the delight of his team mates.